Tapping into the fluid and kinetic energy of skateboarders is Transit Space, an energetic new acrobatic dance work by Diavolo Dance Theater, the internationally renowned modern dance company. Diavolo is currently enjoying a residency at Valley Performing Arts Center, on the campus of California State University, Northridge. 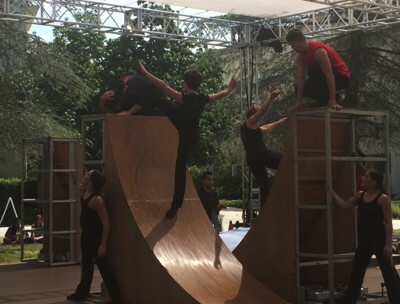 This week, outdoors in the Sierra quad, the troupe is giving twice-daily performances of Transit Space — a lively piece inspired by skateboard culture. Artistic Director Jacques Heim explains that the dancers are all credited as contributing choreography, such as acrobatic moves, elegant lifts and thrilling leaps from the summits of the steeply-raked ramps. The Diavolo residency culminates on September 19 and 20 with the American premiere of L’Espace du Temps, a trilogy of dance works — Foreign Bodies, Fearful Symmetries, and Fluid Infinities — in which dance pieces to musical works by Philip Glass, John Adams, and Esa-Pekka Salonen will be performed live by the New West Symphony and conducted by Los Angeles conductor Christopher Rountree. 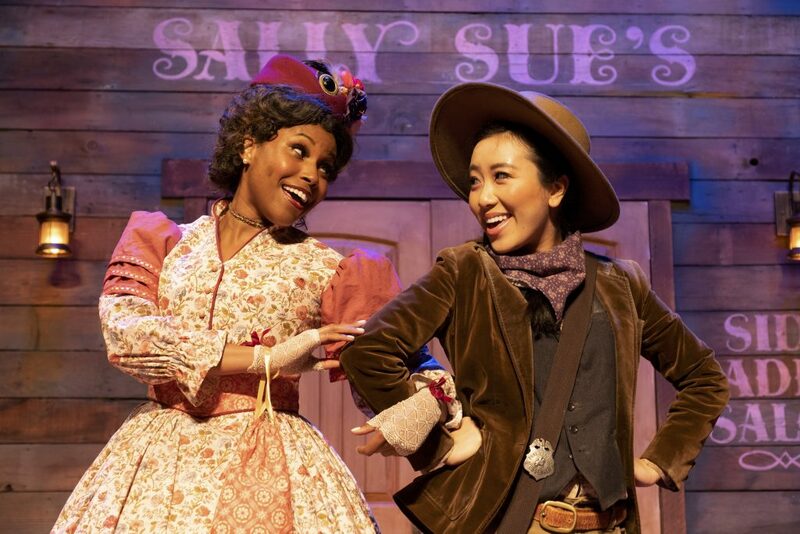 These performances at Valley Performing Arts Center will be the first time that the trilogy will be performed in the United States and with live orchestral accompaniment. About Transit Space — Skateboarders are always in “transit.” They are always looking ahead of themselves, skating on a ramp, staircase, railing or other intriguing structure. If skateboarders always worried about falling, they would never be able to go forward. We should be dealing with our life the same way that skateboarders deal with theirs … feeling free. Transit Space is also a piece that touches on the idea that you don’t need anybody to tell you where to go or what to do. You don’t need a map to figure out where to go. You can create your own map to figure out your future, your destiny. Everything you need is inside you. You are your own map. Your body is your map. Influenced by the documentary Dogtown and Z-Boys, Transit Space uses skateboard ramps as set pieces to represent an urban environment with ever-shifting physical and emotional spaces. Skateboarders don’t need a map to move from place to place. They move with conviction and commitment, as if they knew already where they are going. Skateboarders use our architecture as their own land. They move through the landscape of our cities like birds in migration. They move in a chaos formation yet are very aware of one another. Like birds in the sky flying by rapidly, creating incredible acrobatic moves, they look elegant and peaceful. Skateboarders are not disturbing the peace. They are more at peace with themselves. When they skate, they are free. Free because they are not worrying about danger or fear. They are in one with their board. L’Espace du Temps, a trilogy of dance works — Foreign Bodies, Fearful Symmetries, Fluid Infinities — is a meditation on the space of time from creation to evolution and finally to an unknown destination. It begins with three questions: “Where do we come from?” “Where are we going?” and “How did everything begin?” From these questions, the trilogy evokes familiar and foreign worlds by exploring the relationship between the shifting architecture of the human experience and the ever-changing processes that lie within and without. Music by Esa-Pekka Salonen, John Adams and Philip Glass.